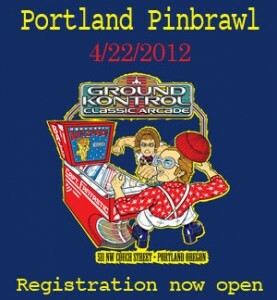 Register now for Portland Pinbrawl 2012! This fourth annual pinball tournament attracts the best pinballers in the Northwest. Registration is capped at 128 players, so sign up soon. The competition takes place on Sunday, April 22th at Ground Kontrol Classic Arcade (511 NW Couch). Must be 21 or over to compete. Once again the tournament will be best 2 of 3, double elimination. Entry fee is $20, but spectators get in free. Find more details and the registration form at Rose City Pinball. Rose City Pinball also maintains a handy dandy list of past and upcoming 2012 area tournaments.